Russia has always been one of the priorities in Vietnam’s external affairs, Prime Minister Nguyen Xuan Phuc informed Russian Ambassador to Vietnam Konstantin Vasilievich Vnukov at a meeting in Hanoi, on November 29. Discussing issues on promoting their bilateral relations, PM Nguyen Xuan Phuc said that there is huge potential for Vietnam – Russia cooperation, stressing that the two Governments need to push their own ministries and agencies to carry out the reached agreements for the best outcome. 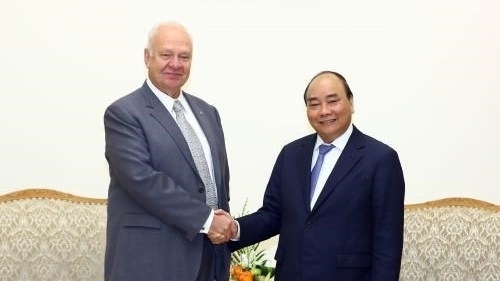 He agreed with the Russian Ambassador’s view that the two sides should promote their cooperation in agriculture and seafood, and called on the two sides to enhance the effectiveness of the Vietnam – Russia Intergovernmental Cooperation Committee, contributing to the friendship and cooperative ties that exist between the two nations. The PM asked the Russian side to facilitate Vietnam’s investment projects in Russia and accelerate the pace of certain cooperation projects. He affirmed that the Vietnamese Government will create optimal condition for Russian citizens to work in the Vietnam-Russia Oil and Gas joint venture Vietsovpetro, as well as other projects in Vietnam. He extended his gratitude to Russia for providing assistance to the Vietnamese flood victims,. For his part, the Russian Ambassador showed his impression of Vietnam’s celebration of the 100th anniversary of the Russian October Revolution, which he described as the most solemn act in a foreign country. He congratulated Vietnam on the success of the APEC Economic Leaders’ Week in Da Nang, noting that 2017 is also a special year in the two nations’ relations with high-level delegation exchanges, including President Tran Dai Quang’s official visit to Russia and President Vladimir Putin’s attendance of the APEC Economic Leaders’ Week in Vietnam. Russia has sent the list of priority items in their bilateral cooperation agenda to Vietnam’s Foreign Ministry, he said, adding that he hopes that Vietnam’s delegations will attend the St. Petersburg International Economic Forum (SPIEF) and several similar events in Russia, as they present numerous opportunities to strengthen the cooperation between the two nations. The ambassador proposed a number of specific areas for future cooperation, including agriculture. 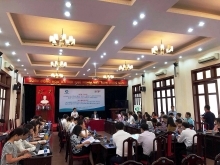 PM Nguyen Xuan Phuc welcomed the proposals, affirming that he will instruct the relevant ministries and sectors to implement them.